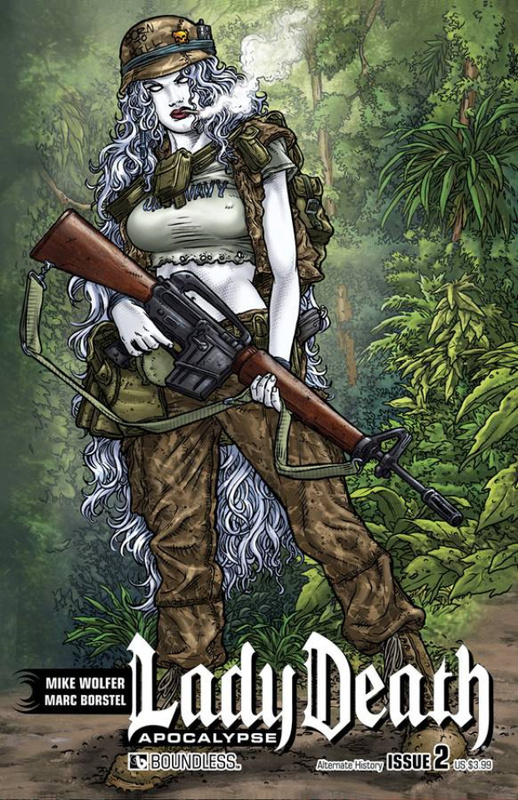 Artist Marc Borstel brings the number one comics bad girl back to life in the exciting new Lady Death: Apocalypse series! Join in the delicious horror as we resurrect the harrowing adventures of the longest running independent femme fatale in comics. Zombie soldiers once stalked the Under Realm at the beck and call of their mistress, Death Queen. After her defeat, the Undead were no more...until tonight! As the specter of the long-forgotten Dire Knights rises to reignite the curse of the Undead, Lady Death is about to discover that these Undead are unlike the reanimated corpse warriors she once defeated. Available with Regular and Sultry covers by Renato Camilo, Wraparound by Pow Rodrix, Auxiliary and Alternate History by Juan Jose Ryp, a premium Pure Art by Camilo and a Art Deco Retailer Order Incentive cover by Michael DiPascale.Also be sure to check out the ultimate collectible CGC Numbered Edition!